LIBERTY, TX (KTRK) -- A reception was held Thursday afternoon, June 16, at Tarver Abstract in Liberty, Texas for the unveiling of a marker recognizing 400 Main Street as the original site of "Commercial Corner" and to present Tarver Abstract and its owner, Charles McGuire, with the Texas Historical Commission's Texas Treasure Business Award. 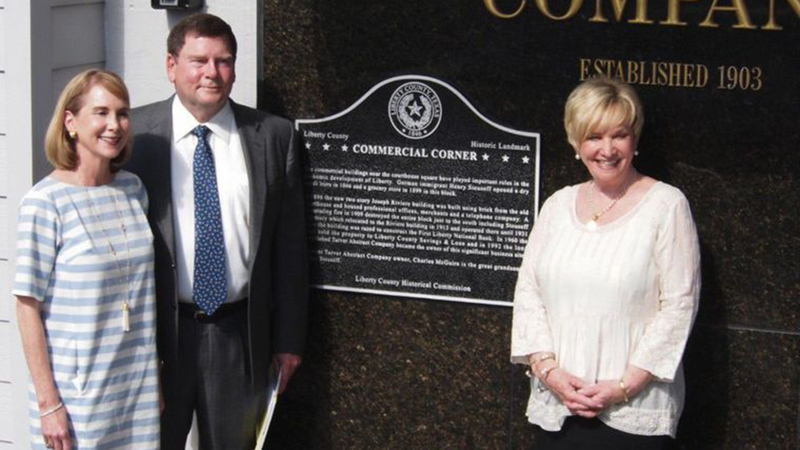 Liberty County Historical Commission Chairperson Linda Jamison welcomed guests to the reception in the lobby of the Tarver building that included live music performed by The Festive Trio Ensemble of Chamber Music Unlimited. Refreshments were served, and McGuire offered a brief history of the site. Joseph Riviere erected a two-story building at that location, on the corner of Main and Sam Houston streets, in 1896 using brick salvaged from the county courthouse that had burned down in 1874. Professionals rented office space in the Riviere building and other tenants included merchants and a telephone company. The story comes to us through a partnership with the Cleveland Advocate.